Since I couldn't find a dub of this special (if one exists), this is my first look at the sub version. At least it's short for my first one. 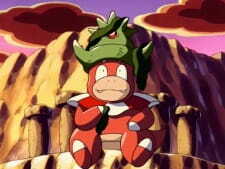 Story: Like most Pokemon shorts, it isn't much, which is good. It just shows what Slowking does during the day. For a 3 minute short, that's good enough. Art: While not as detailed as the movie, it's still pretty good and the sunset scene is beautiful. Sound: This is the lowest point of the review. For a short, the little kid voices that constantly repeat "Things Slowking likes...*insert whatever Slowking is doing now*" become annoying fast. It would have been much better without them and having the only sound being the music, sound effects, and Slowking talking. Character: The only character here is Slowking, unless you really count the 2 or 3 Pokemon he comes across. He's pretty much just like how he is in the movie. Relaxed and without a care in the world, which is good. Enjoyment: For as short as it is, it's enjoyable. However, I can do without the constant yelling of what Slowking is doing.